Hall of Famer Pearl Moore will conduct her 9th annual basketball camp for girls the week of July 11-14 in the Wilson High School gymnasium. It is open to girls, ages 7-17. The only cost is a $15 registration fee which includes lunch, a t-shirt and trophies. The deadline to enter is June 24. There is no late registration. The day camp will be held from 8:15 a.m. untill 3:30 p.m. each day. 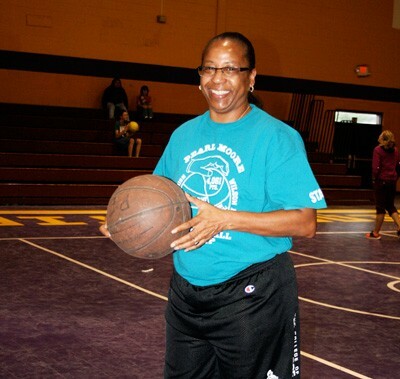 Pearl Moore, women’s basketball’s all-time scoring leader, is a 1979 Francis Marion University graduate. The Wilson High School graduate played for the Patriots 1975-79, and as a four-time All-American scored 4,061 career points. Pearl was inducted into the Francis Marion Hall of Fame in 1992, the South Carolina Athletic Hall of Fame in 2000, and was a part of the inaugural class for the Florence Area Athletic Hall of Fame in 2006. She played professionally for one season in Venezuela. Moore began hosting the basketball camps for girls in 2007 because she wanted to give back to the community. “Not all kids can afford to attend $300 or $400 camps. I just want to give every kid a chance to see what it feels like, even if they don’t continue playing,” Pearl commented. “It’s also an opportunity to boost their self worth.” Moore said she couldn’t conduct the camp without the support of local sponsors and a core group of volunteers who have been devoting their time and energy for as long as she has. Parents are invited to attend and view all sessions. For more information or to get a registration form, you may call Pearl Moore at 843-661-7376.